A new wildlife crossing tunnel in Bedminster, NJ. A few weeks ago I visited Bedminster Township in Somerset County with my camera to see something new: New Jersey’s first modern wildlife crossing tunnels, five in all. They provide safe passage under the road for the state-threatened wood turtle, not to mention all the other amphibians and reptiles that will use them. Very short wooden fences funnel the animals into the tunnels rather than onto the road, where they regularly get squished by traffic. You’ll see us crawling through one in the first episode of The Creature Show. 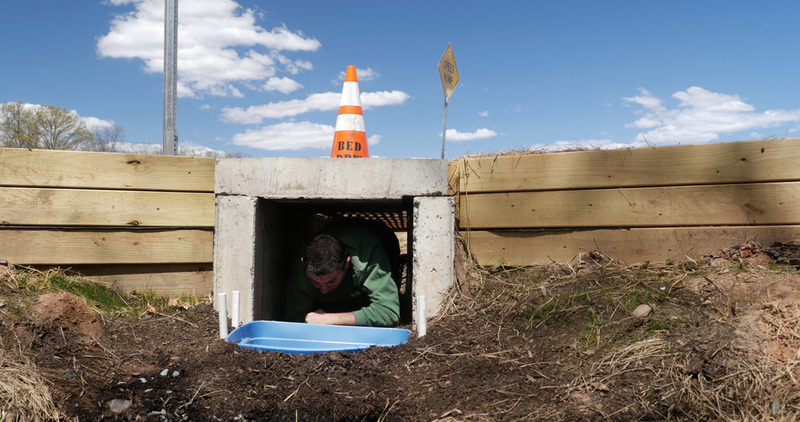 These wildlife tunnels strike me as remarkably noteworthy because they represent a very local, very tangible example of the next big movement in global conservation biology: restoring connectivity. The biggest threat to species on Earth is habitat loss, and the biggest new driver of habitat loss is climate change, which will impact each and every habitat on the planet. It’s nice to think that humans will get their act together to stop climate change, but pragmatic conservationists are beginning to think about the escape routes that hundreds of thousands of displaced species will need to travel if they are to survive into the next century. This means connecting two sides of a busy road, as well as connecting national parks across countries and entire continents. In New Jersey, a new coalition of biologists and planners called Connecting Habitat Across New Jersey is beginning to think through this challenge on the state level. As they begin to get down to work, The Creature Show is excited for the opportunity to highlight some of their efforts.